Since the beginning of the 20th century, especially since the reform and opening up, historical and archeological research in China has made remarkable achievements. However, due to the increasing differentiation of disciplines, there is still much room for development in the exchange of theories and achievements in history and archeology. In this context, finding ways to break the gap between disciplines has become a widespread issue of concern in the Chinese academic community. From May 31 to June 2, jointly organized by Historical Research of Social Science in China Press, Shandong Provincial Education Department and Shandong Normal University, and undertaken by the Qilu Cultural Institute of Shandong Normal University, the first session of the Social Science in China Press Forum on Ancient History, also the Taishan Academic Forum “Transboundary and Exchange: A Dialogue between History and Archaeology” of the Shandong Provincial Department of Education was held in Jinan, Shandong Province. Zhu Fenghan, a professor of history at Peking University, said that Chinese archaeological and historical research must be closely connected. The important prerequisite is to deepen and standardize the two disciplines’ own research. Taking the archaeological exploration of the Xia culture as an example, Zhu proposed that archaeologists should focus on records with credibility. Historical scholars need to make prudent examinations of ancient Chinese texts to verify their authenticity. 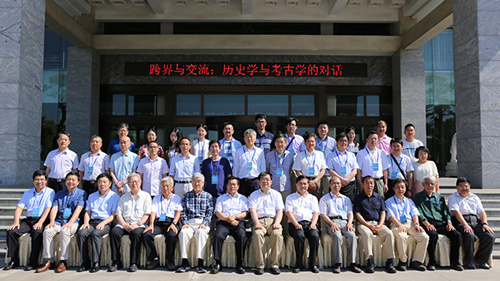 Shen Changyun, a professor from the School of History and Culture at Hebei Normal University, combining literature records and archaeological excavations, systematically discussed his theories on the origin of the surname of the Xia Dynasty royalty in the East. Wang Zhenzhong, CASS Member and research fellow at the CASS Institute of History, said that although history, archeology and anthropology each have their own advantages and limitations, they have problems that they themselves cannot solve. In this light, he proposed reconstructing the Chinese ancient history system with archaeology as the framework, literature as the source materials and anthropological data as a reference. Xu Hong, a research fellow from the CASS Institute of Archeology, took the example of the Erlitou site, which he had worked on for nearly 20 years, to emphasize the importance of using historical philology and archeology from different perspectives to jointly construct ancient history. The forum focused on the origin of Chinese civilization and the early development of Xia, Shang and Zhou dynasties. It carried out in-depth discussions from archaeology, history, theory and other aspects and achieved many important results. The forum has the following features: First, new dialogue models and effective communication. The forum invites historical and archaeological experts, aiming to promote interdisciplinary exchanges and to lead academic trends. Second, new frontier topics have been identified. For instance, Song Zhenhao, CASS Member and research fellow at the CASS Institute of History, introduced his team’s work on the collection and publication of oracle bone character description in recent years. They have emphasized the identification of more than 90 new characters in the interpretation process. Third, the forum focuses on comparative study of ancient historical theories and civilization. For example, Xu Lianggao’s “Reconsideration of the Relationship between Traditional Historical Philology and Archaeology,” Chen Xi’s “Dual Evidence Law in the Progress of Archaeological Theory and Methodology,” Duan Qingbo’s “Chinese Civilization under the Values, Life and World Outlook” and Chen Shengqian’s “Stages of Chinese Ancient History from the Perspective of Materialism,” and so on have deeply reflected from various perspectives on related theoretical issues in the study of ancient history. Zhao Shichao’s “Pre-Qin China and Ancient Greece,” Peng Changlin’s “From Hùng Vuong to An Duong Vuong: An Analysis of the Ancient History of the Origin of Vietnamese Civilization,” and Lu Zhongyang’s “Study on Xishuangbanna Designed Service System” study the similarities and differences between cultures with ethnographic data.